Not to be confused with 1st Cavalry Regiment (United States). The 1st Cavalry Division ("First Team") is a combined arms division and is one of the most decorated combat divisions of the United States Army. It is based at Fort Hood, Texas. It was formed in 1921 and served during World War II, the Korean War, the Vietnam War, the Persian Gulf War, with the Stabilization Force in Bosnia-Herzegovina, in the Iraq War, in the War in Afghanistan and in Operation Freedom's Sentinel. As of October 2017, the 1st Cavalry Division is subordinate to III Corps and is commanded by Major General Paul T. Calvert. The unit is unique in that it has served as a Cavalry (horse) Division, an Infantry Division, an Air Assault Division and an Armored Division throughout its existence. On 20 August 1921, the War Department Adjutant General constituted the 1st and 2nd Cavalry Divisions to meet partial mobilization requirements, and authorized the establishment of the 1st Cavalry Division under the new TO&E on 31 August 1921. Since 1st Cavalry Division was to assemble from existing units, it was able to go active in September 1921, even though the subordinate units did not arrive completely until as late as 1922. 1st Cavalry Division was assigned to the VIII Corps Area, with its division headquarters and 2d Brigade located at Fort Bliss, Texas, and the 1st Brigade at Camp Harry J. Jones in Douglas, Arizona. The headquarters facilities used by 1st Cavalry Division were those previously vacated by 8th United States Brigade when it was commanded by MG John J. Pershing in 1916, and the wartime 15th Cavalry Division, which had existed at Fort Bliss between 10 December 1917 and 12 May 1918. The 1st Cavalry Division's assembled at Douglas, Arizona. The 1st, 7th, and 8th Cavalry Regiments had previously been assigned to the wartime 15th Cavalry Division until they were returned to the VIII Corps Area troop list on 12 May 1918. 1st Cavalry Regiment remained assigned until it was transferred to 1st Cavalry Division on 20 August 1921. The 7th, 8th, and 10th Cavalry Regiments were transferred on 13 September 1921, although the assignment of the 10th Cavalry Regiment to the 1st Cavalry Division was controversial because the transfer violated the Jim Crow laws. This controversy continued until 18 December 1922, when the 5th Cavalry Regiment, then on the VIII Corps Area Troop List, swapped places with the 10th Cavalry Regiment. In 1923 the 1st Cavalry Division held division maneuvers for the first time, intending to hold them annually thereafter. However, financial constraints made that impossible. Only in 1927, through the generosity of a few ranchers who provided free land, was the division able to conduct such exercises again. In 1928 Major General Herbert B. Crosby, Chief of Cavalry, faced with personnel cuts, reorganized the cavalry regiments, which in turn reduced the size of the 1st Cavalry Division. Crosby's goal was to decrease overhead while maintaining or increasing firepower in the regiment. After the reorganization each cavalry regiment consisted of a headquarters and headquarters troop; a machine gun troop; a medical and chaplain element; and two squadrons, each with a headquarters element; and two line troops. The cavalry brigades' machine gun squadrons were inactivated, while the responsibility for training and employing machine guns fell to the regimental commanders, as in the infantry. About the same time that Crosby cut the cavalry regiment, the army staff, seeking to increase the usefulness of the wartime cavalry division, published new tables of organization for an even larger unit. The new structure increased the size of the signal troop (177), expanded the medical unit to a squadron (233), and endorsing Crosby's movement of the machine gun units from the brigades to the regiments (2X176). A divisional aviation section, an armored car squadron (278), and tank company (155) were added, the field artillery battalion was expanded to a regiment (1,717), and divisional strength rose to 9,595. With the arrival of the 1930s, serious work started on the testing and refining of new equipment and TO&Es for a mechanized and motorized army. To facilitate this, 1st Cavalry Division traded 1st Cavalry Regiment for 12th Cavalry Regiment on 3 January 1933. Taking into account recommendations from the VIII Corps Area, the Army War College, and the Command and General Staff School, the board developed a new smaller triangular cavalry division, which the 1st Cavalry Division evaluated during maneuvers at Toyahvale, Texas, in 1938. Like the 1937 infantry division test, the maneuvers concentrated on the divisional cavalry regiments around which all other units were to be organized. Following the test, a board of 1st Cavalry Division officers, headed by Brigadier General Kenyon A. Joyce, rejected the three-regiment division and recommended retention of the two-brigade (four-regiment) organization. The latter configuration allowed the division to deploy easily in two columns, which was accepted standard cavalry tactics. However, the board advocated reorganizing the cavalry regiment along triangular lines, which would give it a headquarters and headquarters troop, a machine gun squadron with special weapons and machine gun troops, and three rifle squadrons, each with one machine gun and three rifle troops. No significant change was made in the field artillery, but the test showed that the engineer element should remain a squadron to provide the divisional elements greater mobility on the battlefield and that the special troops idea should be extended to include the division headquarters, signal, and ordnance troops; quartermaster, medical, engineer, reconnaissance, and observation squadrons; and a chemical warfare detachment. One headquarters would assume responsibility for the administration and disciplinary control for these forces. Although the study did not lead to a general reorganization of the cavalry division, the wartime cavalry regiment was restructured, effective 1 December 1938, to consist of a headquarters and headquarters troop, machine gun and special weapons troops, and three squadrons of three rifle troops each. The special troops remained as structured in 1928, and no observation squadron or chemical detachment found a place in the division. With the paper changes in the cavalry divisions and other minor adjustments, the strength of a wartime divisional rose to 10,680. Toyahvale, TX Maneuvers – 7 October through 30 October 1939. Cravens-Pitkin Louisiana Maneuvers – 13 August through 24 August 1940. Second 3rd Army Louisiana Maneuvers – 10 August through 4 October 1941. VIII Corps Louisiana Maneuvers near Mansfield, LA – 27 July 1942 – 21 September 1942. With the attack on Pearl Harbor on 7 December 1941, the "great laboratory" phase for developing and testing organizations, about which Marshall wrote in the summer of 1941, closed, but the War Department still had not developed ideal infantry, cavalry, armored, and motorized divisions. In 1942 it again revised the divisions based on experiences gained during the great GHQ maneuvers of the previous year. As in the past, the reorganizations ranged from minor adjustments to wholesale changes. 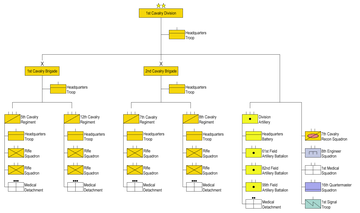 1st Cavalry Division retained its square configuration after the 1941 maneuvers, but with modifications. The division lost its antitank troop, the brigades their weapons troops, and the regiments their machine gun and special weapons troops. These changes brought no decrease in divisional firepower, but placed most weapons within the cavalry troops. The number of .50-caliber machine guns was increased almost threefold. In the reconnaissance squadron, the motorcycle and armored car troops were eliminated, leaving the squadron with one support troop and three reconnaissance troops equipped with light tanks. These changes increased the division from 11,676 to 12,112 officers and enlisted men. The last of the 1st Cavalry Division's mounted units permanently retired their horses and converted to infantry formations on 28 February 1943. However, a mounted special ceremonial unit known as the Horse Platoon – later, the Horse Cavalry Detachment – was established within the division in January 1972. Its ongoing purpose is to represent the traditions and heritage of the American horse cavalry at military ceremonies and public events. The 1st Cavalry Division arrived in Australia as shown above, continued its training at Strathpine, Queensland, until 26 July, then moved to New Guinea to stage for the Admiralties campaign 22–27 February 1944. The division experienced its first combat in the Admiralty Islands, units landing at Los Negros on 29 February 1944. Momote airstrip was secured against great odds. Attacks by Japanese were thrown back, and the enemy force surrounded by the end of March. Nearby islands were taken in April and May. The division next took part in the invasion of Leyte, 20 October 1944, captured Tacloban and the adjacent airstrip, advanced along the north coast, and secured Leyte Valley, elements landing on and securing Samar Island. Moving down Ormoc Valley (in Leyte) and across the Ormoc plain, the division reached the west coast of Leyte 1 January 1945. The division then invaded Luzon, landing in the Lingayen Gulf area 27 January 1945, and fought its way as a "flying column" to Manila by 3 February 1945. More than 3,000 civilian prisoners at the University of Santo Tomas, including more than 60 US Army nurses (some of the "Angels of Bataan and Corregidor") were liberated, and the 1st Cavalry then advanced east of Manila by the middle of February before the city was cleared. On 20 February the division was assigned the mission of seizing and securing crossings over the Marikina River and securing the Tagaytay-Antipolo Line. After being relieved 12 March in the Antipolo area, elements pushed south into Batangas and provinces of Bicol Region and aiding Filipino forces under the Philippine Commonwealth Army and Philippine Constabulary together with the recognized guerrillas. They mopped up remaining pockets of resistance in these areas in small unit actions. Resistance was officially declared at an end 1 July 1945. The division left Luzon 25 August 1945 for occupation duty in Japan, arriving in Yokohama 2 September 1945 and entering Tokyo 8 September, the first United States division to enter the Japanese capital. 101 unit was set up in May 1945 to search for the missing soldiers in the Second World War. The detachment consisted of 17 people, three of them officers: Captain MacColeman, Lieutenant Foley and Sergeant Ryan. The operation was successful, although it lasted three years. Occupation duty in Japan followed for the next five years. In the summer of 1950, North Korea attacked South Korea, and the 1st Cavalry Division was rushed to Korea to help shore up the Pusan Perimeter. From 26 to 29 July 1950, the 7th Cavalry Regiment, one of the Division's three infantry regiments, killed at least 163 South Korean civilians in an incident now known as the No Gun Ri massacre. While the 7th Cavalry was directly responsible, Divisional commanders, including General Hobart R. Gay, had given them orders to do so. After the X Corps attack at Incheon, a breakout operation was launched at the Pusan Perimeter. The Division then joined the UN counteroffensive that recaptured most of South Korea by the end of September. The UN offensive was continued northwards, past Seoul, and across the 38th Parallel into North Korea on 1 October. The momentum of the attack was maintained, and the race to the North Korean capital, Pyongyang, ended on 19 October when elements of the Division and the Republic of Korea Army (ROK) 1st Infantry Division captured the city. The advance continued, but against unexpectedly stiffening resistance. The Chinese People's Volunteer Army (PVA) entered the war on the side of North Korea, making their first attacks in late October. On 28 October 1950, Eighth Army commander General Walton Walker relieved the 1st Cavalry Division of its security mission in Pyongyang. The division's new orders were to pass through the ROK 1st Division's lines at Unsan and attack toward the Yalu River. Leading the way on the twenty-ninth, the 8th Cavalry regiment departed Pyongyang and reached Yongsan-dong that evening. The 5th Cavalry Regiment arrived the next morning, with the mission to protect the 8th Cavalry regiment's rear. With the arrival of the 8th Cavalry Regiment at Unsan on the 31st, the ROK 1st Division redeployed to positions northeast, east, and southeast of Unsan; the 8th Cavalry took up positions north, west, and south of the town. Meanwhile, the ROK 15th Regiment was desperately trying to hold its position east of the 8th Cavalry, across the Samt'an River. During the afternoon of 1 November, the PVA attack north of Unsan gained strength against the ROK 15th Regiment and gradually extended to the right flank of the 1st Battalion, 8th Cavalry. At nightfall, the 1st Battalion controlled the northern approaches to the Samt'an River, except for portions of the ROK 15th Regiment's zone on the east side. The battalion's position on the left was weak; there were not enough soldiers to extend the defensive line to the main ridge leading into Unsan. This left a gap between the 1st and 2nd Battalions. East of the Samt'an the ROK 15th Regiment was under heavy attack, and shortly after midnight it no longer existed as a combat force. At 19:30 on 1 November, the PVA 116th Division attacked the 1st Battalion, 8th Cavalry, all along its line. At 21:00 PVA troops found the weak link in the ridgeline and began moving through it and down the ridge behind the 2nd Battalion, penetrating its right flank and encircling its left. Now both the 1st and 2nd Battalions were engaged by the enemy on several sides. Around midnight, the 8th Cavalry received orders to withdraw southward to Ipsok. At 01:30 on 2 November, no PVA activity was reported in the 3rd Battalion's sector south of Unsan. But as the 8th Cavalry withdrew, all three battalions became trapped by roadblocks made by the PVA 347th Regiment, 116th Division south of Unsan during the early morning hours. Members of the 1st Battalion who were able to escape reached the Ipsok area. A head count showed the battalion had lost about 15 officers and 250 enlisted men. Members of the 2nd Battalion, for the most part, scattered into the hills. Many of them reached the ROK lines near Ipsok. Others met up with the 3rd Battalion, the hardest hit. Around 03:00 the PVA launched a surprise attack on the battalion command post. Hand-to-hand fighting ensued for about half an hour before the PVA were driven from the area. The disorganized members of the 3rd Battalion formed a core of resistance around three tanks on the valley floor and held off the PVA until daylight. By that time, only six officers and 200 enlisted men were still able to function. More than 170 were wounded, and the number dead or missing were uncounted. Attempts by the 5th Cavalry to relieve the beleaguered battalion were unsuccessful, and the 3rd Battalion, 8th Cavalry, soon ceased to exist as an organized force. 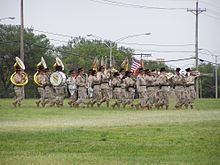 Following the battle, there were disparaging rumors about the 1st Cavalry Division's fighting abilities, including a folk song of the time called "The Bug-Out Ballad". The series of engagements that are rumored to have given rise to the song were due (at least partly) to the myth that the division lost its unit colors. Other Army and Marine units disparagingly described the division shoulder insignia as representing 'The horse they never rode, the river they never crossed, and the yellow speaks for itself'. Another version goes: "The shield they never carried, the horse they never rode, the bridge they never crossed, the line they never held, and the yellow is the reason why." 5th Cavalry Regiment: Lloyd L. Burke (28 October 1951), Samuel S. Coursen (12 December 1950), and Robert M. McGovern (30 January 1951). 16th Reconnaissance Company: Gordon M. Craig (10 September 1950). Division troops land at P'ohang-Dong, Korea. Cavalrymen holding a 2.36 in Bazooka. Gun crew of a 105mm howitzer in action along the 1st Cavalry Division sector. A Division observation post overlooks Hill 518, held by the North Koreans north of Waegwan. September 1950. A .50 Cal. Machine gun squad of Co. E, 2nd Battalion, 7th Regiment, 1st Cavalry Division, fires on North Koreans along the north bank of the Naktong River, 26 August 1950. Capt. Emil Kapaun, right, a chaplain with the 3rd Battalion, 8th Cavalry Regiment, helps evacuate an exhausted soldier from the battlefield. The 1st Cavalry Division remained in the line until it was relieved by the 45th Infantry Division from the United States Army National Guard in January 1952. Following the relief, the division returned to Japan. The division returned to Korea in 1957, where it remained until 1965. The 1st Cavalry Division next fought in the Vietnam War. No longer a conventional infantry unit, the division had become an air assault division as the 1st Cavalry Division (Airmobile), commonly referred to as the 1st Air Cavalry Division. The use of helicopters on such large scale as troop carriers, cargo lift ships, medevacs, and as aerial rocket artillery, was never before implemented, but by doing so it freed the infantry from the tyranny of terrain to attack the enemy at the time and place of its choosing. In 1965, colors and subordinate unit designations of the 1st Cavalry Division were transferred from Korea to Fort Benning, Georgia, where they were used, along with separate elements of what had been the 2nd Infantry Division, to reflag the existing 11th Air Assault Division (Test) into the 1st Cavalry Division (Airmobile). Concurrently, the personnel and units of the 1st Cavalry Division, which remained in Korea, were used to reflag the division into a new 2nd Infantry Division. Shortly thereafter, the 1st Cavalry Division (Airmobile) began deploying to Camp Radcliff, An Khe, Vietnam, in the Central Highlands and was equipped with the new M16 rifle, the UH-1 troop carrier helicopter, UH-1C gunships, the CH-47 Chinook cargo helicopter, and the massive CH-54 Skycrane cargo helicopter. All aircraft carried insignia to indicate their battalion and company. 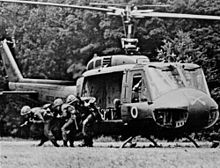 A UH-1D helicopter climbs after discharging infantrymen. Troops unload from a CH-47 helicopter in the Cay Giep Mountains, Vietnam, 1967. January 31, 1968. Start of Tet Offensive as seen from LZ Betty's water tower, Quang Tri. April 4, 1968. 1st Cav forces at LZ Stud, the staging area for Operation Pegasus. April 26, 1968. Operation Delaware, second crashed helicopter on Signal Hill, A Shau Valley. July 1968. Two 1st Cavalry Division LRP teams, Quang Tri. Unknown Date. Tunnel rat preparing for entering Vietnamese Tunnel, Vietnam. 1965. Photo of USS Boxer (CV-21/LPH-4) loaded with helicopters of the 1st Cavalry Division. The division's first major operation was to help relieve the Siege of Plei Me near Pleiku and the pursuit of the withdrawing North Vietnamese Army which culminated in the Battle of Ia Drang, described in the book We Were Soldiers Once...And Young, was also the basis of the film We Were Soldiers. Because of that battle the division earned the Presidential Unit Citation (US), the first unit to receive such in the war. In 1966, the division attempted to root the communist Viet Cong and the North Vietnamese army (PAVN) out of Binh Dinh province with Operation Masher, Operation Crazy Horse and Operation Thayer. 1967 was then spent conducting Operation Pershing, a large scale search and destroy operation of communist base areas in II Corps in which 5,400 communist soldiers were killed and 2,000 captured. In Operation Jeb Stuart, January 1968, the division moved north to Camp Evans, north of Hue and on to Landing Zone Sharon and Landing Zone Betty, south of Quang Tri City, all in the I Corps Tactical Zone. 27 January 1968. 1st Cavalry Division LRP at LZ Betty prelude to Tet. In the early morning hours of 31 January 1968, the largest battle of the Vietnam War, the Tet Offensive, was launched by 84,000 communist soldiers across South Vietnam. In the 1st Cavalry Division's area of operation, the North Vietnamese Army (NVA) and Vietcong forces seized most of the city of Huế. As the 3rd Brigade, 1st Cavalry Division, fought to cut off communist reinforcements pouring into Huế, at Quang Tri City, five battalions, most from the 324th NVA Division, attacked the city and LZ Betty (Headquarters 1st Brigade). To stop allied troops from intervening, three other communist infantry battalions deployed as blocking forces, all supported by a 122mm-rocket battalion and two heavy-weapons companies armed with 82mm mortars and 75mm recoilless rifles. After intense fighting, 900 NVA and Vietcong soldiers were killed in and around Quang Tri City and LZ Betty. However, across South Vietnam, 1,000 Americans, 2,100 ARVNs, 14,000 civilians, and 32,000 NVA and Vietcong were killed. In March 1968 the 1st Cavalry Division shifted forces to LZ Stud, the staging area for Operation Pegasus to break the siege of the Marine combat base at Khe Sanh—the second largest battle of the war. All three brigades participated in this airmobile operation, along with a Marine armor thrust. US Air Force B-52s alone dropped more than 75,000 tons of bombs on North Vietnamese soldiers from the 304th and 325th Divisions encroaching the combat base in trenches. As these two elite enemy divisions, with history at Dien Bien Phu and the Ia Drang Valley, depleted, the 1st Cavalry Division (Airmobile) leapfrogged west, clearing Route 9, until at 0:800 hours 8 April, the 2nd Battalion, 7th Cavalry, linked-up with Marines at the combat base, ending the 77-day siege. LRPs on Signal Hill directing artillery on enemy trucks in valley. On 19 April 1968, as the 2nd Brigade continued pushing west to the Laotian border, the 1st and 3rd Brigades (about 11,000 men and 300 helicopters) swung southwest and air assaulted A Shau Valley, commencing Operation Delaware. The North Vietnamese Army was a well-trained, equipped, and led force. They turned A Shau into a formidable sanctuary —complete with PT76 tanks; powerful crew-served 37mm antiaircraft cannons, some radar controlled; twin-barreled 23mm cannons; and scores of 12.7mm heavy machine guns. 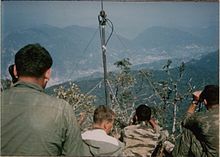 A long-range penetration operation was launched by members of the 1st Cavalry Division (Airmobile)'s, long-range reconnaissance patrol, against the North Vietnamese Army when they seized "Signal Hill" the name attributed to the peak of Dong Re Lao Mountain, a densely forested 4,879 feet (1,487 m) mountain, midway in the valley, so the 1st and 3rd Brigades, slugging it out hidden deep behind the mountains, could communicate with Camp Evans near the coast or with approaching aircraft. Despite hundreds of B-52 and jet air strikes in Operation Delaware, the NVA and communist forces shot down a C-130, a CH-54, two Chinooks, and nearly two dozen UH-1 Hueys. Many more were lost in accidents or damaged by ground fire. The division also suffered more than 100 dead and 530 wounded in the operation. Bad weather aggravated the loss by causing delays in troop movements, allowing a substantial number of NVA to escape to safety in Laos. Still, the NVA lost more than 800 dead, a tank, 70 trucks, two bulldozers, 30 flamethrowers, thousands of rifles and machine guns, and dozens of antiaircraft cannons. They also lost tons of ammunition, explosives, medical supplies and foodstuffs. In mid-May 1968 Operation Delaware ceased, however, the division continued tactical operations in I Corps as well as local pacification and "medcap" (medical outreach programs to local Vietnamese). In the autumn of 1968, the 1st Cavalry Division relocated south to Phước Vĩnh Base Camp northeast of Saigon. In May 1970, the 1st Cavalry Division participated in the Cambodian Incursion, withdrawing from Cambodia on 29 June. Thereafter, the division took a defensive posture while US troops withdrawals continued from Vietnam. On 29 April 1971 the bulk of the division was withdrawn to Fort Hood, Texas, but its 3rd Brigade remained as one of the final two major US ground combat units in Vietnam, departing 29 June 1972. However, its 1st Battalion, 7th Cavalry, Task Force Garry Owen, remained another two months. In the Vietnam War, the First Cavalry Division suffered more casualties than any other army division: 5,444 men killed in action and 26,592 wounded in action. However, the First Marine Division suffered 7,012 men killed in action and the Third Marine Division suffered 6,869 men killed in action. 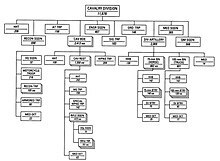 This list of air cavalry troops is alphabetical by regiment, per the U.S. Army Combat Arms Regimental System, known as CARS, in use from 1957 to 1981. Under this system the unit nomenclature "regiment" was not used to designate the lineage of companies/batteries/troops or their parent battalions/squadrons. However, there were five armored cavalry regiments (ACRs) not organized under CARS, these units, including the 11th ACR, retained the "regiment" nomenclature in their official designation. In the aftermath of Vietnam, the 1st Cavalry Division was converted from the air-mobile light infantry role into a triple capabilities (TRICAP) division. The unit received an infusion of mechanized infantry and artillery, to make it capable of missions needing three types of troops; armored, air-mobility, and air cavalry. In the post-Vietnam era, morale in the US Army waned. In response, from 1973 through 1979 HQDA permitted local commanders to encourage morale-enhancing uniform distinctions. Consequently, many units embraced various colored berets, for example armor and armored cavalry units often adopted the black beret. Similarly many other units including the First Cavalry Division embraced various colored berets in an attempt to improve dwindling morale. The First Cav decided to assign various colored berets to the three major TRICAP and division support units. In this implementation, armored cavalry, airmobile infantry units, air cavalry units, division artillery units, and division support units all wore different colored berets, including black, light blue, kelly green, and red. However, the TRICAP concept was short-lived, and by 1975, the division was equipped as a two-brigade armored division with its third brigade provided by the Mississippi Army National Guard's 155th Armored Brigade from 1984–1991. The division participated in numerous REFORGER exercises, and was used to test new doctrinal concepts and equipment, including the XM-1 tank. The unit assignment and structure changed significantly, notably when 1st Battalion, 9th Cavalry, the division's most famous unit, was inactivated. The 13th Signal Battalion fielded mobile subscriber equipment (MSE), a secure digital communications system for corps and below units. Battle plan for the first Gulf War, with the 1st Cavalry Division attacking through the center of the main force. The 1st Cavalry next fought as a heavy division, during Operation Desert Storm in January and February 1991. It participated in the Battle of Norfolk. The 1st Cavalry Division deployed in October 1990 as part of VII Corps. The division's 'round-out' formation, the 155th Armored Brigade was not deployed in a surprise political decision. It was planned to augment the division by attaching the Tiger Brigade from the 2nd Armored Division, but that brigade was attached to the 1st Marine Expeditionary Force (1st & 2nd Marine Divisions) to add heavy armor support to that force. 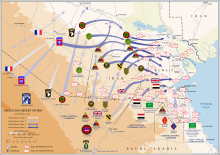 Consequently, the 1st Cavalry Division was assigned the role of the VII Corps' reserve for much of the ground war, but was crucial in the movement of ground forces to the Kuwaiti and west Saudi Arabian theaters by making two assaults into Iraqi held territory with the division's Black Jack Brigade moving north drawing Iraqi divisions out of Kuwait to support the Iraqi units defending in Iraq. This movement was led by the 1st Battalion, 5th Cavalry, from the Wadi Al-Batien to just north of Basra through several Iraqi divisions before stopping. The assault by M1 Abrams main battle tanks, M2 Bradley infantry fighting vehicles, and other support vehicles moved much faster than was thought possible, catching the Iraqi Army off guard. The 13th Signal Battalion was the first unit in the U.S. Army to deploy mobile subscriber equipment (MSE) into combat. Installing, operating, and maintaining communications equipment to support a communications network spanning over 280 kilometers, the 13th Signal Battalion again provided the division's communications. 13th Signal Battalion was the first unit in the U.S. Army to provide digital communications in Southwest Asia. It was a gateway link from the Port of Dammam to the U.S. Army XVIII Airborne Corps Headquarters. After the division returned from Kuwait, the 1st "Tiger" Brigade, 2nd Armored Division was redesignated as the 3rd Brigade, 1st Cavalry Division. In response to the continued hostile movements by the Iraqi Armed Forces after Desert Storm, the U.S. Department of Defense ordered successive Operation Intrinsic Action deployments by combat brigades and special forces units to the Iraq/Kuwait border. The 1st Cavalry's three brigades contributed heavily to the decade-long deployments from 1992–2002. The 1st Cavalry Division took control of the U.S. peacekeeping contingent in Bosnia-Herzegovina with approximately 6,900 personnel on 20 June 1998, as part of the multinational Stabilization Force (SFOR). 1st Brigade served for Rotation SFOR 4. 2nd Brigade served for Rotation SFOR 5. 2nd Brigade was alerted for action during the Russian move from Bosnia to the Pristina International Airport in June 1999, but no action was ultimately taken after consultation at the highest levels in NATO. In August 1999, the 10th Mountain Division took over operations in the Tuzla/Multinational Division North area. Elements of the division arrived in Washington, D.C., shortly after the September 11 attacks. Soldiers from the 1st Cavalry Division engaging insurgents in the Battle of Baqubah, 14 March 2007. In October 2001 an advance party of a division brigade combat team was deployed to the Iraq/Kuwait border. Some divisional units participated in the initial 2003 invasion of Iraq. The division in its entirety deployed to Iraq in January 2004, sending an initial detachment of the 9th Cavalry Regiment into combat in September 2003. The 1st Cavalry relieved the 1st Armored Division in Baghdad. Among its subordinate formations were: Louisiana's 256th Infantry Brigade; Arkansas' 39th Infantry Brigade; element of A Company, 28th Signal; elements of Washington's 81st Armored Brigade; and the 2nd Battalion, 162nd Infantry (Oregon Army National Guard), Co.E/126th ATCS, MAARNG. After spending more than a year in Iraq, it redeployed back to the US by April, 2005. It was relieved by the 3rd Infantry Division. Division Artillery (DIVARTY) was organized as the 5th BCT. It contained HHB, DIVARTY; 1–7 CAV; 1–8 CAV; 1–21 FA; and the 515th FSB (Provisional). The division fought in many key battles against insurgents, including the Second Battle of Fallujah in 2004, where the 2nd Brigade Combat Team engaged in house to house intense urban combat to root out enemy cells in the city. During its OIF2 deployment division assigned and attached personnel numbered approximately 40,000. 168 personnel were killed in action, with approximately 1,500 wounded. The division assumed duties as Headquarters, Multi-National Division – Baghdad from November 2006 to December 2007. 4th Brigade Combat Team, activated in 2005, arrived in Ninawa Governorate in October and November 2006. However, 2–12 Cavalry was detached, deployed to Baghdad to augment the division efforts there. The 3rd Brigade Combat Team, "Greywolf", deployed to the Diyala Province in September 2006 and fought in the Battle of Baqubah as a part of the Iraq War troop surge of 2007. The division assumed duties as the Headquarters, Multi-National Division – Baghdad Jan 2009– Jan 2010. The deployment was extended by 23 days past the one year mark. The 4th Brigade Combat Team "Long Knife" deployed to Mosul, Nineva Province, September 2010 to September 2011. In November 2001, elements of the 1st Cavalry Division (3rd Platoon-545 MP CO, originally assigned to 2nd brigade "BlackJack" 1st Cav)deployed to Bagram Airfield, Afghanistan as part of Operation Enduring Freedom – Afghanistan. In May 2011, the division headquarters deployed in support of Operation Enduring Freedom and assumed command of Regional Command East, replacing the 101st Airborne Division. The 1st Infantry Division HQ took command of RC-East on 19 April 2012. In June 2014, the division headquarters returned to Afghanistan and assumed command of Regional Command South, replacing the 4th Infantry Division. In October 2014, the division flag returned to Fort Hood, leaving its Deputy Commanding General behind as the new Train Advise Assist Command South. Operation Enduring Freedom – Afghanistan (OEF-A) ended in late 2014. After the completion of Operation Enduring Freedom – Afghanistan, the new US deployment to Afghanistan was known as Operation Freedom's Sentinel. In June 2015, the division element in TAAC South was relieved by an element from the 7th Infantry Division Headquarters. In September 2016, the 1st Cavalry Division Headquarters deployed again to Afghanistan, this time with the 1st Cavalry Division Sustainment Brigade alongside it. The headquarters serves as the United States Forces - Afghanistan National Support Element, and is also responsible for Bagram Airfield, the largest US military base in Afghanistan. It supports forces serving in the United States' Operation Freedom's Sentinel and NATO's Resolute Support Mission, enabling both the international effort to train, advise, and assist the Afghan National Defense and Security Forces and the counterterrorism fight. The 1st Cavalry Division Sustainment Brigade also supports both Operation Freedom's Sentinel and Resolute Support, and is the Army's only currently-deployed active duty Sustainment Brigade. The division's 3 ABCT deployed in February 2017 to Kuwait, and elements of 3ABCT supported operations in Iraq to retake Mosul from ISIS. The 1st Cavalry Division currently holds three of the active Army's ten Armored Brigade Combat Teams. The division provides the Army and Combatant Commanders with trained and ready forces. In April 2014, 2-5 Cavalry from 1 ABCT, 1CD deployed to Europe to support Operation Combined Resolve II, a NATO exercise in southeastern Germany. In October 2014, 1CD returned to Europe to support its NATO partners in another pair of exercises, this time participating in Operations Combined Resolve III and Atlantic Resolve with the majority of 1ABCT. A battalion task force from the 1st Cavalry Division Air Cavalry Brigade deployed to Germany in November 2015; it participated in Atlantic Resolve, then stayed in Germany for the next nine months to provide aviation support to US and NATO forces across Europe. In June 2015, 2 ABCT was the first rotational brigade deployed to South Korea, relieving 1ABCT/2 ID as it inactivated. 2 ABCT deployed for nine months; in February 2016, the Army called on the First Team again, and 2 ABCT was replaced by 1 ABCT on another nine-month rotation. 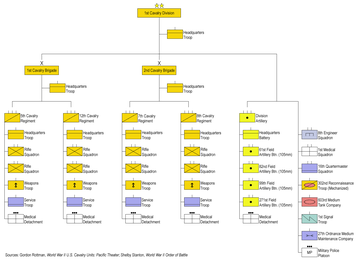 On 15 July 2005, the 1st Cavalry Division transitioned to the Unit of Action modified table of organization and equipment (MTOE). No longer are battalion-sized elements made up purely of armor and/or infantry battalions. Brigades are now composed of combined arms battalions (CAB), meaning every maneuver battalion combines infantry and armor, excluding the brigade reconnaissance squadrons. Division Headquarters and Headquarters Battalion "Maverick"
1st Armored Brigade Combat Team, "Ironhorse"
1st Squadron, 7th Cavalry (RSTA) "Garryowen!" 2nd Battalion, 5th Cavalry "Lancers"
2nd Battalion, 8th Cavalry "Stallions"
2nd Battalion, 12th Cavalry "Thunder Horse"
1st Battalion, 82nd Field Artillery (1-82nd FAR) "Dragons"
91st Brigade Engineer Battalion (91st BEB) "Sabers"
115th Brigade Support Battalion (115th BSB) "Muleskinners"
2nd Armored Brigade Combat Team "Black Jack"
4th Squadron, 9th Cavalry (RSTA) "Darkhorse"
1st Battalion, 5th Cavalry "Black Knights"
1st Battalion, 8th Cavalry "Jumping Mustangs"
1st Battalion, 9th Cavalry "Head Hunters"
3rd Battalion, 16th Field Artillery (3-16th FAR) "Rolling Thunder"
8th Brigade Engineer Battalion (8th BEB) "Trojan Horse"
15th Brigade Support Battalion (15th BSB) "Gambler"
3rd Armored Brigade Combat Team "Greywolf"
6th Squadron, 9th Cavalry (RSTA) "Saber"
2nd Battalion, 7th Cavalry "Ghost"
3rd Battalion, 8th Cavalry "Warhorse"
1st Battalion, 12th Cavalry "Chargers"
2nd Battalion, 82nd Field Artillery (2-82nd FAR) "Steel Dragons"
3rd Brigade Engineer Battalion (3rd BEB) "Beavers"
215th Brigade Support Battalion (215th BSB) "Blacksmiths"
the 1st Cavalry Division's Combat Aviation Brigade performs a mock charge with the horse detachment. Combat Aviation Brigade (CAB) "Warrior"
1st Battalion, 227th Aviation Regiment "First Attack"
2nd Battalion, 227th Aviation Regiment "Lobos"
3rd Battalion, 227th Aviation Regiment "Spearhead"
615th Aviation Support Battalion (615th ASB) "Cold Steel"
The 4th Brigade Combat Team "Long Knife" inactivated in October 2013: the Special Troops Battalion, 4th BCT; the 5th Battalion, 82nd Artillery; and 27th Brigade Support Battalion were inactivated with some of the companies of the latter two used to augment artillery and support battalions in the remaining three BCTs. The 1st Squadron, 9th Cavalry joined the 2nd Brigade Combat Team, the 2nd Battalion, 7th Cavalry joined the 3rd Brigade Combat Team and the 2nd Battalion, 12th Cavalry joined the 1st Brigade Combat Team. The 3rd Cavalry Regiment was subordinate to the Division until March 2017. The shoulder sleeve insignia was originally approved 3 January 1921, with several variations in colors of the bend and horse's head to reflect the subordinate elements of the division. The design was authorized for wear by all subordinate elements of the division on 11 December 1934, and previous authorization for the variations was canceled. The insignia is worn subdued on field uniforms after experience in the Vietnam War, where the gold was too conspicuous. Normally, the gold is changed to the base color of the uniform to subdue it. With the retirement of the green "Class A" uniform in October 2015, only the subdued version of the SSI is worn, on the ACU's left sleeve. It consists on a yellow, triangular Norman shield with rounded corners 5.25 inches (133 mm) in height overall, a black diagonal stripe extends over the shield from upper left to lower right, and in the upper right a black horse's head cuts off diagonally at the neck, all within a 0.125-in green border. Yellow was chosen because it is the traditional cavalry color, and the horse's head refer to the division's original cavalry structure. Black, symbolic of iron, alludes to the transition to tanks and armor. The black diagonal stripe represents a sword baldric and is a mark of military honor; it also implies movement "up the field" and thus symbolizes aggressive elan and attack. The one diagonal bend and the one horse's head also allude to the division's numerical designation. Symbolism: The device is a miniature reproduction of the 1st Cavalry Division's shoulder sleeve insignia with the addition of two five-pointed stars. The Division Commander and the Division Staff wore the distinctive insignia design from 1922 to 1934 as a shoulder sleeve insignia. Background: The distinctive unit insignia was approved 25 August 1965. The Flag of the 1st Cavalry Division is a white field with the distinctive yellow triangular Norman shield with rounded corners, a black diagonal stripe extending over the shield from upper left to lower right and in the upper right a silhouetted horse's head cut off diagonally at the neck with a green border. The 1st Cavalry Division is featured in the 1979 film Apocalypse Now (1–9 Cavalry). The 1986 film Platoon is an extrapolation of director (and 1st Cavalry Division veteran) Oliver Stone's experiences in Vietnam. The characters of Sgt. Elias K. Grodin (Willem Dafoe) and S/Sgt. Robert Barnes (Tom Berenger) were real soldiers. Juan Angel Elias died in combat in Quang Tri Province, Vietnam, on 29 May 1968, serving with the 2nd Platoon, Company E, 52nd Inf. (LRP), and John Barnes, served in the same platoon at the same time and retired from the Army as a SGM. In the film, Elias wears the 1st Cavalry Division's unit insignia as his combat patch (the unit depicted in the film is: B Co, 3-22IN, 3d BDE, 25th ID—Stone having served with both divisions). The 1992 book We Were Soldiers Once… And Young, along with its 2002 film adaptation, follows the 1st Battalion of the 7th Cavalry Regiment during the Battle of Ia Drang. In the 2012 movie Men in Black 3, the guardsman protecting the Apollo 11 launch site is part of this division. The 1st Cavalry Division was depicted in the National Geographic Channel miniseries, "The Long Road Home (miniseries)," created by Mikko Alanne. The miniseries was based on the 2007 book The Long Road Home: A Story of War and Family by Martha Raddatz. The miniseries premiered on November 7, 2017, on National Geographic. Oliver Stone's service with Company E, 52nd Infantry (LRP), 1st Air Cavalry Division, in Vietnam and his movie Platoon. Allen M. Burdett, Jr. commanded the division's 11th Aviation Group from 1965 to 1966. ^ a b c d "Special Unit Designations". United States Army Center of Military History. 21 April 2010. Archived from the original on 9 June 2010. Retrieved 23 June 2010. ^ "News Release: Army Announces Divisions to Remain in the 10-Division Force". Defense.gov. 12 March 2009. Archived from the original on 2 March 2010. Retrieved 13 November 2011. ^ "The Horse Cavalry Detachment". Hood.army.mil. Archived from the original on 2 November 2011. Retrieved 13 November 2011. ^ Capt. Scott Kuhn (October 29, 2018) 1st Cavalry Division Soldier missing since Korean War laid to rest 3rd Bn, 8th Cav Regiment. Missing since 2 Nov 1950, remains repatriated July 2018. ^ "The Bug-Out Ballad". Sniff.numachi.com. Retrieved 13 November 2011. ^ "Loss of Colors". United States Army Center of Military History. Archived from the original on 9 June 2010. Retrieved 13 July 2010. ^ a b c d e Ankony, Robert C. (2008). Lurps: A Ranger's Diary of Tet, Khe Sanh, A Shau, and Quang Tri. Hamilton Books. ISBN 978-0-7618-4373-3. ^ Tolson, John, Lt. Gen., Vietnam Studies: Airmobility 1961-1971, Department of the Army, Washington, D.C., 1973. ^ a b Ankony, Robert C. (October 2008). "No Peace in the Valley". Vietnam Magazine. pp. 26–31. ^ Stanton, Shelby, Anatomy of a Division: The 1st Cav in Vietnam, Presidio Press, Novato, CA, 1987:146. ^ Stanton, Shelby, Anatomy of a Division: The 1st Cav in Vietnam, Presidio Press, Novato, CA, 1987. ^ Lt. Gen. Tolson, John J. Vietnam Studies: Airmobility 1961 - 1971, Department of the Army, Washington, D.C. (1973). ^ Stanton, Shelby, L., Anatomy of a Division: The 1st Cav in Vietnam, Presidio Press, CA (1987). ^ CDR Kenneth Davis, US Navy (ret), and associates of the Coffelt Database of Vietnam casualties. ^ Carpenter, William, and Robert Ankony, "First Casualties: First Cav LRRPs," CFM Research, Nov. 2015. ^ "Apaches are the attack helicopters of choice in Iraqi battle". Odessa American. Associated Press. 24 March 2003. ^ a b "Meet Operation Freedom's Sentinel, the Pentagon's new mission in Afghanistan". Washington Post. 29 December 2014. ^ "Army: 500 from 1st Cavalry Division deploy to Afghanistan". Stars and Stripes. 22 March 2016. ^ "Combined Resolve II to exercise Army's European Rotational Force". www.army.mil. Retrieved 21 April 2017. ^ "1st Cav's Ironhorse Brigade to support Operation Atlantic Resolve in Europe". DVIDS. Retrieved 21 April 2017. ^ "Cavalry Soldiers wrap up successful Atlantic Resolve rotation". www.army.mil. Retrieved 21 April 2017. ^ "Regionally Allocated Forces from 1st CAV arrive in Germany". www.army.mil. Retrieved 21 April 2017. ^ "Fort Hood, Texas | 1st Cavalry Division". Hood.army.mil. 2 October 2015. Retrieved 13 October 2015. ^ Geiger, Capt. Grace (5 April 2017). "3rd Cav Regt transitions to III Corps". Killeen, TX: 3rd Cavalry Regiment Public Affairs Office. DVIDS. Retrieved 8 April 2017. ^ For more variations on the unit's shoulder sleeve insignia, see "Rag Clippings" (PDF). The Trading Post. American Society of Military Insignia Collectors: 19–20. April – June 2009. Archived from the original (PDF) on 2 May 2014. ^ Here is a link to a source showing the flag and description. Wikimedia Commons has media related to 1st Cavalry Division (United States). 1st Cavalry Division Home Page – official site. This page was last edited on 16 April 2019, at 05:06 (UTC).